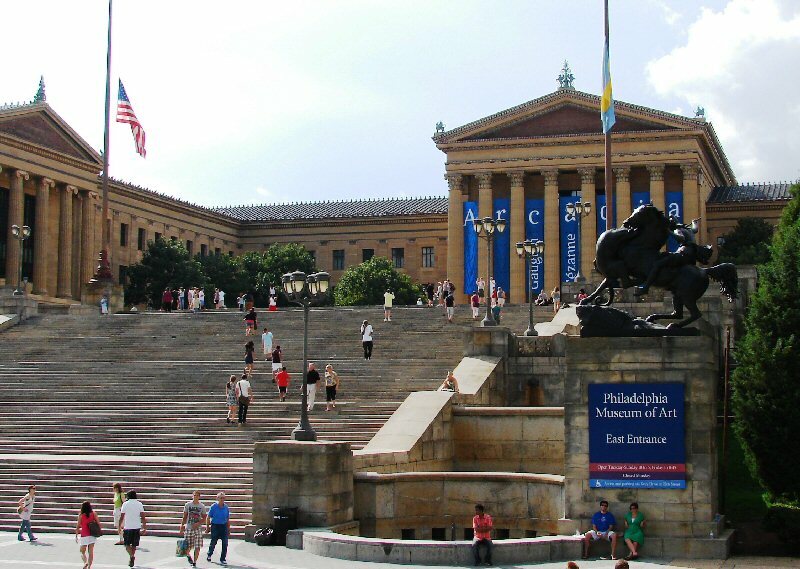 The 72 steps leading up to the Philadelphia Art Museum are called the “Rocky Steps” after Rocky’s run up the flight in the movie of the same name. It became symbolic of the ability of an underdog to triumph. Today, some tourists run up the steps in Rocky fashion. The view at the top is great. 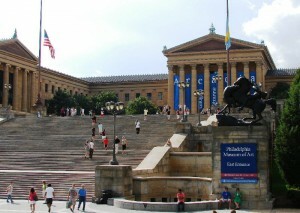 According to the Big Bus tour guide, Sylvester Stallone, who played Rocky, never ran up the steps. Stallone ran up a few steps and his double ran the rest. A 10-foot tall bronze Rocky statue was originally at the top of the steps and then moved to the bottom of the steps where it became a popular attraction. However, it was considered a movie prop not art so it was moved to a different location. Due to its popularity it was returned to the Art Museum in 2006 with much fanfare. I like one-topic museums especially when we are trying to cover as many local attractions as possible. So John and I headed for another famous bronze statue, “The Thinker,” which sits in a place of prominence in front of the Rodin Museum. Philadelphia is home to one of the best Auguste Rodin collections. Rodin is considered the father of modern sculpture. The small museum in a Beaux Arts building has several dozen of Rodin works. 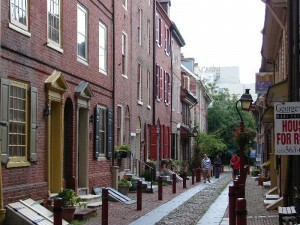 Philadelphia has a plethora of museums that would take weeks to visit. 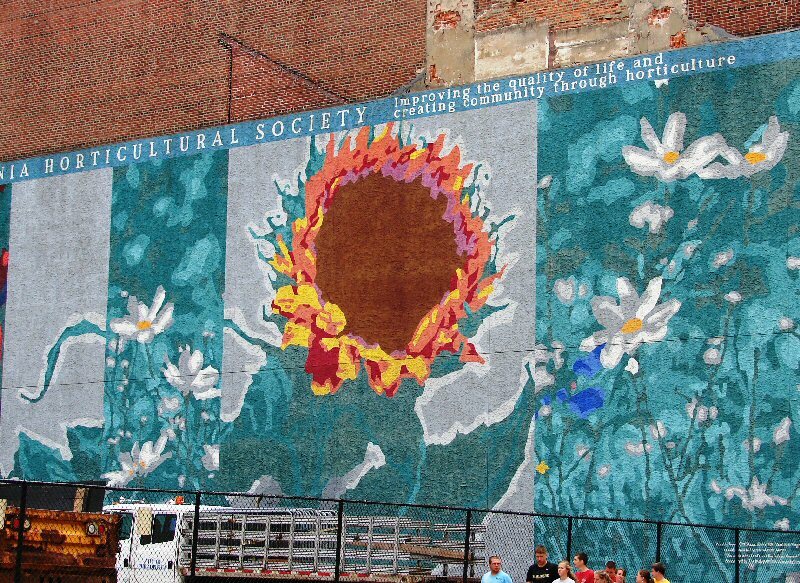 The city had a problem with graffiti which led to the Mural Arts Program in 1984 which was based on the concept if you can’t fight them join them. I love creative solutions to a problem. The Anti-Graffiti Network hired muralist Jane Golden to reach out to graffiti painters and redirect their energies to constructive mural painting. The mural walking tour is very popular. 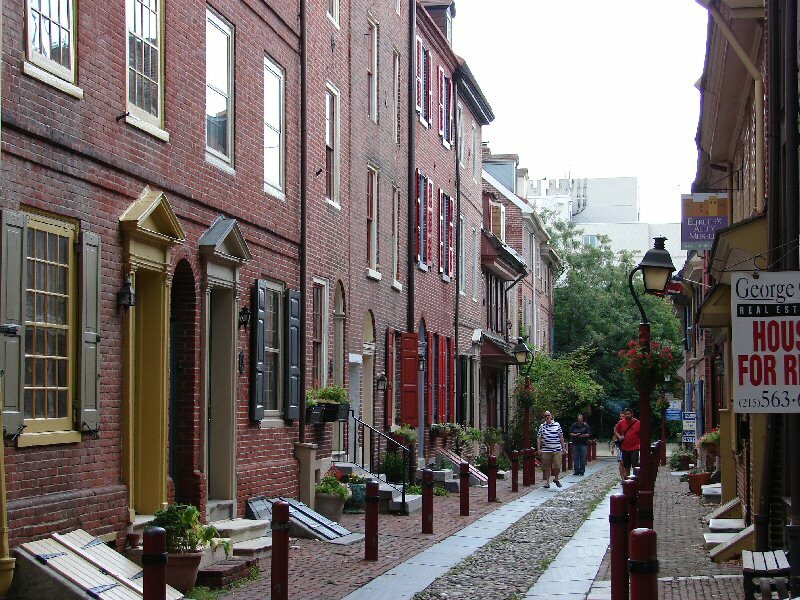 Architecture is also a form of art and Philly has an eclectic mix of historic and moderns styles. The massive ornate City Hall in Second Empire style and not far away is Elfreth’s Alley, the oldest continuously inhabited residential street in America, with architecture dating from 1702. Take note of the gizmo next to some of the upper story windows. It is call a busybody mirror and was invented by Benjamin Franklin to allow residents to look out their second floor window and watch the street below. Franklin had his hand in many things. We stopped by the Christ Church and left our penny with many others on Franklin’s grave. It seemed a bit ironic since Franklin said, “A penny saved is a penny earned” and all the pennies represent people who tossed theirs away. The cemetery collects about $6,000 a year from the deposited pennies, which goes to the upkeep of the cemetery. Christ Church burial ground is near the U.S. Mint where they make 50 million coins a day seven days a week – including pennies. The lobby is home to several historic Tiffany mosaics. There were too many things we didn’t have time to see and do – next time.